MySocLab should only be purchased when required by an instructor. Race and Ethnicity in the United States explores the complex history of cultural differences in a nation comprised of immigrants. By examining major themes of multiculturalism, discrimination, injustice, and diversity, the text explores the historical patterns of our country’s treatment of people of different faiths, colors, and cultures. The Eighth Edition discusses recent 21st century phenomena in diversity and immigration in the United States, including the rising number of Latino and Asian American youth and the continued discrimination of Native American populations. Providing a broad yet current assessment of our nation’s immigration and multicultural patterns, the text serves as a comprehensive source for racial and ethnic studies. Race and Ethnicity in the United States, Eighth Edition is also available via REVEL ™, an immersive learning experience designed for the way today's students read, think, and learn. Richard T. Schaefer grew up in Chicago at a time when neighborhoods were going through transitions in ethnic and racial composition. He found himself increasingly intrigued by what was happening, how people were reacting, and how these changes were affecting neighborhoods and people’s jobs. In high school, he took a course in sociology. His interest in social issues caused him to gravitate to more sociology courses at Northwestern University, where he eventually received a B.A. in sociology. “Originally as an undergraduate I thought I would go on to law school and become a lawyer. But after taking a few sociology courses, I found myself wanting to learn more about what sociologists studied and was fascinated by the kinds of questions they raised,” Dr. Schaefer says. “Perhaps most fascinating and, to me, relevant to the 1960s was the intersection of race, gender, and social class.” This interest led him to obtain his M.A. and Ph.D. in sociology from the University of Chicago. Dr. Schaefer’s continuing interest in race relations led him to write his master’s thesis on the membership of the Ku Klux Klan and his doctoral thesis on racial prejudice and race relations in Great Britain. Dr. Schaefer went on to become a professor of sociology. He has taught sociology and courses on multiculturalism for 30 years. He has been invited to give special presentations to students and faculty on racial and ethnic diversity in Illinois, Indiana, Missouri, North Carolina, Ohio, and Texas. Dr. Schaefer is the author of Racial and Ethnic Diversity in the USA (Pearson 2014) and Racial and Ethnic Groups, fourteenth edition(Pearson, 2014). 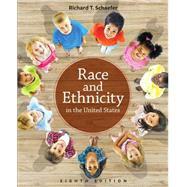 Dr. Schaefer is the general editor of the three-volume Encyclopedia of Race, Ethnicity, and Society (2008). He is also the author of the thirteenth edition of Sociology (2012), the eleventh edition of Sociology: A Brief Introduction (2015), third edition Sociology: A Modular Approach (2015), and the sixth edition of Sociology Matters (2013). Schaefer coauthored with William Zellner the ninth edition of Extraordinary Groups (2011), which, in 2014, was translated into Japanese. His articles and book reviews have appeared in many journals, including American Journal of Sociology, Phylon: A Review of Race and Culture, Contemporary Sociology, Sociology and Social Research, Sociological Quarterly, and Teaching Sociology. He served as president of the Midwest Sociological Society from 1994 to 1995. In recognition of his achievements in undergraduate teaching, he was named Vincent de Paul Professor of Sociology in 2004. Biracial and Multiracial Identity: Who Am I?